This was really something. 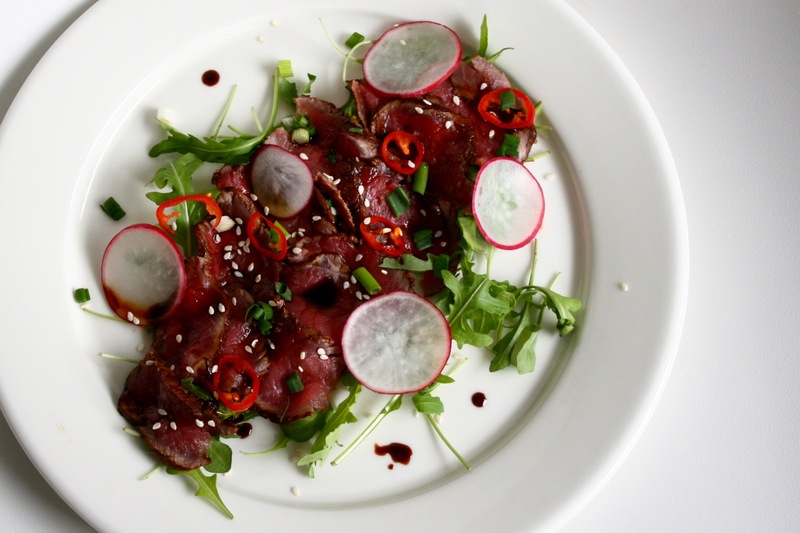 Beef carpaccio with asian twist. Original recipe is from here and I accidentally modified it a bit but it turned out really good. I marinated the meet first and afterwards I fried it quickly. Meat is really delicious in this way, so in the future I will prepare the dish at the same way than described below. Season fillet with salt and pepper and start preparing marinade. Chop spring onion, garlic clove, fresh chilli pepper and ginger. Grate lemon zest from half of a lemon. Mix ingredients together and add lemon juice, soy sauce and rice wine. Poor the marinade into a small plastic bag and lift the meat into it. Put to a fridge and let it rest there about 8 hours. Prepare the sauce. Peel and grave ginger and press the ginger juice to a small bowl. Add lime juice and all the remaining ingredients. After the meat has marinated about 8 hours in fridge you can start to fry it. Add oil to a pan and fry meat about 30 seconds of each side in hot pan. When the meat has cooled down wrap it into a plastic and place into freezer for 1,5 hours so it is easier to cut into thin slices. Just before serving the dish cut meat into thin slices. Slice radish, chilli pepper and spiring onion as well and tear coriander leaves. Place arugula to plates, cover it with meat slices and season with sauce. Add slices of radish, spring onion, chilli pepper and coriander. Garnish with sesame seeds. Serve with extra sauce and salt flakes (if needed).